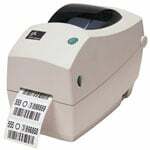 There are two main types of barcode printers, Thermal Transfer Printers and Direct Thermal Printers. Thermal Transfer printers are the ideal tool for barcodes that need to last for a long period of time without fading in many different environments. Thermal Transfer Printers use a ribbon (wax or resin) to imprint the desired image on the label. Thermal Transfer printers are the most chosen option for product labeling, asset labeling, inventory tracking, and applications that need to withstand outdoor elements. Call one of our experts or check out our full line of barcode printers to select the correct printer for your needs.